We share the vision for a better nation but why take such a risk? The Sunday Post is as Scottish as haggis and Maw Broon’s tartan shawl. We are proud to be the only Sunday newspaper wholly based, owned and head-quartered in Scotland. Throughout our 100-year history, we have always fought for what we believed is best for our readers. Our campaigns from fighting for pasteurised safe milk, cleaner coal, safer roads and better health care to battling nuisance calls and those who prey on the weak and elderly have improved the lives and communities of those we serve. Our pages reflect our core values of honesty, decency and fairness. We strive to present balance, strip away spin and sensation, and treat all political viewpoints with respect, although we support no political party. We have always said what we think is right. From the heart but to the point. The Sunday Post wants the same thing as all Scots the best for our nation. No matter which side of the debate you support, there is a future and a vision we all agree on every voter, every man, woman and child, wants a fairer, better Scotland, free of poverty and with shared prosperity. The mood of the nation is clear. We want important decisions made by us, for us. Everyone must have a voice. Scottish affairs should be decided in the interests of Scotland. Though there are differences in opinion on how to achieve it, everyone, from the most ardent Yes voter to the most convinced No voter, wants the best for Scotland. There is also a growing but welcome movement for social change and the nation is engaged with politics like never before. We are immensely proud to see so many people passionately debating their vision of the future. This is, in large part, because of the Yes campaign capturing hearts and galvanising support. As a gifted politician Alex Salmond’s passion has brought the nation’s concerns to the fore and finally woken up Westminster to the anger and power of the disenfranchised. The case for the Union has at last produced a positive commitment for change with real powers on offer. Over the course of the campaign The Sunday Post has examined the arguments and has come to a conclusion, as all Scots must on September 18. It would be wrong for us not to offer an opinion when we have been so immersed in the debate and analysis. In doing this we hope that, if nothing else, our readers will appreciate that we can’t just sit on the fence. We understand why many of the people of Scotland are convinced going it alone is the best way forward. Indeed, several of our own columnists have argued their belief in independence long and hard on the pages of our newspaper. We respect their points of view as we respect all points of view. However, The Sunday Post believes the case for independence, at this time, is unproven and carries too many risks. It is our considered opinion that the best option, the safer option, is to deliver the vision of a better Scotland with the safety net of the United Kingdom. And we do not naively take a stance. We realise that some will castigate us. Sadly, some may vow to never buy our paper again. But we resolved from the outset to be honest with you. Let us give our reasons for taking this unprecedented step. The Scottish way is one of honest endeavour and success built on hard work. We like to balance the books and be prudent. We hope for the best and prepare for the worst. Independence comes with many unknowns. If just one of these fails to deliver the rosy future promised, then the nation could face terribly hard times. To come to this decision brings us no joy. We aren’t choosing a political party’s side, we aren’t aligning with any political leader. We are Scottish, living and working in Scotland, looking dispassionately at the facts. 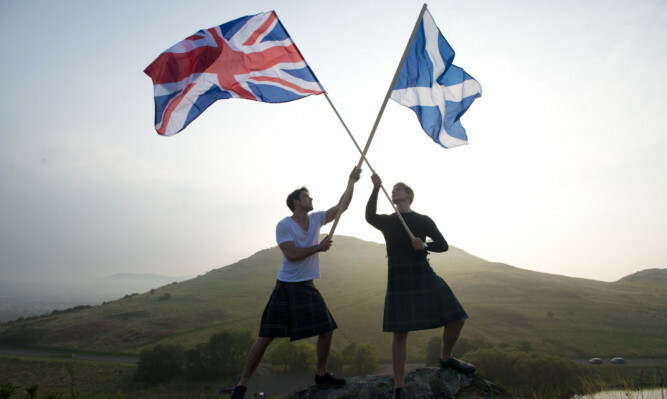 We, like all Scots, have wondered and speculated, discussed and debated which path would be best for the nation we love. It would be easier to shout for a new order because there are things that clearly need to be, and must be, addressed. But walking away from the UK is not in and of itself the cure for society’s and democracy’s ills. Independence is a constitutional change, not a magic wand to transform Scotland. It would bring with it years of draining negotiations before the repair work could even begin. We don’t need to be separate to achieve change. We don’t have to be a different nation to have a different society. We don’t have to be independent to be Scottish. Our united 300-year history has been one of remarkable achievements. Scots have played a key role in the advancement of society in all walks of life. The collective strength of the UK has allowed us to be a powerful economic force on the world stage. That umbrella, that safety net, that success story, is too important to easily cast aside. However, the future we all seek is one of significant change for the better. One where we, our families and loved ones, and the generations that will follow, will live in a secure nation, a caring, fairer society and enjoy healthier, happier and more prosperous lives. And it will only be achieved by all of Scotland pulling together. Whatever the result on Thursday, Scotland will get more powers. If it’s No we commit to hold those in power to account and ensure they deliver what they have promised. If it’s Yes we pledge to play our part in helping to build the new nation. The will of the people is too great, too strong to be ignored now. For 100 proud years, the Sunday Post has championed Scotland and its people we will continue to do that whatever the result. On Thursday, you will give your opinion in the one place that really matters. No matter which side you support, go to the polling booth with your head held high, because you are doing what you truly believe to be the best thing and no one can ask any more of you.